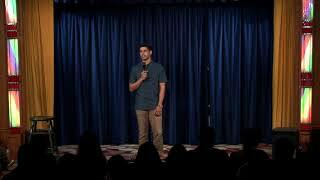 Adam Mamawala is a stand-up comedian based out of New York City. Named one of Funny or Die’s "Top 30 Under 30: Comedians to Watch", Adam recently appeared on MTV's Girl Code and has headlined over 200 colleges across more than 35 states, earning him the title of Campus Activities Magazine’s “Fastest Rising Star” in 2013. In the past year, Adam has taken part in the Boston Comedy Festival and Laughing Skull Comedy Festival, was a semi-finalist in Carolines' New York's Funniest Competition (as seen on SeeSo) and a finalist in the Laughing Devil Comedy Festival, finishing 5th out of 72 comics. He has been featured as Time Out New York’s “Joke of the Week”, has been a Freelance Contributor to Saturday Night Live’s Weekend Update and Someecards, and recently headlined Carolines on Broadway, one of NYC's preeminent comedy clubs!